Demonstrators at the Echangeur de Limete, Kinshasa, capital of the Democratic Republic of the Congo (DRC). Warning of an extremely fragile political situation in the Democratic Republic of the Congo (DRC), where “actors on all sides appear more and more willing to resort to violence to achieve their ends,” the top United Nations official in the country called today on the Security Council to urge the parties to return to dialogue, guarantee the right to peaceful opposition and to end impunity for violence. “The tipping point towards grave violence could arrive very rapidly,” said Maman Sidikou, Special Representative of the Secretary-General and Head of the UN Organization Stabilization Mission in the Democratic Republic of the Congo (MONUSCO). “I believe the Council must remain actively seized of the situation,” also encouraging regional organizations to engage more closely with the situation. Recalling that in September, after a group of opposition parties called the Rassemblement boycotted the national dialogue despite the efforts of a facilitator named by the African Union, he said the Independent National Electoral Commission had announced that presidential elections would not be feasible until 18 November 2018, with completion of the voter registry by 31 July 2017. That announcement, he said, triggered wide-spread condemnation by the opposition, who claimed that the Electoral Commission was being used to extend President Joseph Kabila’s incumbency beyond constitutional limits. The Rassemblement subsequently called for the President to step down by 19 December 2016. “Against this backdrop of polarization,” Mr. Sidikou said that on 19 and 20 September, serious violence erupted following large-scale demonstrations in the Congolese capital, Kinshasa, and elsewhere, during which, the UN had confirmed, there were at least 49 civilians killed, 38 by gunshot, others burned alive or killed by machete. More than 140 were injured, with four officers allegedly killed by demonstrators. MONUSCO investigations, he said, had documented the involvement of both State and non-State actors. In all this, the Mission has continued its call for restraint by all actors. Mr. Sidikou said he had personally raised concerns about the role of State violence with his Government interlocutors and had worked with the diplomatic community and civil society to build bridges between the parties. He also liaised closely with the Government on confidence-building measures to encourage dialogue, notably through the release of political prisoners and allowing media to operate without constraints. The Mission has reinforced its presence in Kinshasa to bolster monitoring the political, security and human rights situation, he added. “While much attention is currently focused on the political situation, I would like to highlight that the security situation in eastern DRC remains very worrying, characterized by severe protection of civilians risks to many communities,” he reported, adding that these tensions are only increasing through the electoral period. He also described MONUSCO’s civilian protection activities, including military operations against armed groups, based on what he called solid cooperation with the Congolese Armed Forces, known by the French acronym FARDC. Also, in regard to the situation in the east, he reported that a precarious situation was created when more than 1,000 ex-combatants were returned to communities in the region as part of the demobilization and reintegration process, but before the Government and World Bank partners had adequately prepared the communities for their return, raising the possibilities of tensions and their return to armed groups. Noting MONUSCO community violence-reduction programmes, Mr. Sidikou called for all partners to quickly put in place the necessary community reintegration measures to allow further returns to occur in a constructive manner. He also appealed for greater support for humanitarian needs in the eastern part of the country, noting that population movements continue, refugees are arriving from South Sudan, epidemics loom and the 2016 appeal is only half funded. With regard to the overall situation of the country, he warned that, while MONUSCO would continue to do everything in its power to protect civilians, large-scale violence due to political polarization could be overwhelming. “The scope of the threats dramatically outstrips the Mission’s capabilities,” he said. 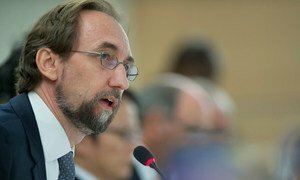 The United Nations human rights chief today strongly warned of the deteriorating situation in the Democratic Republic of the Congo (DRC) in the wake of violent clashes between protestors and security forces earlier this week, insisting that those who committed the killings and other human rights violations during these incidents must be held accountable in order to avert a major crisis.